Thanks to Pixar, the tilted ‘E’ has been straightened out and its upright character finally restored once more. Hanging off its principal axis, it has been a key signifier of the Bright Labyrinth, which can be characterized as an environment that functions both through humans and despite them. The tilted E can clearly be seen in the logos for Dell computers and collapsed US power-traders Enron. As such, it will always remain a nostalgic reminder of a time when things were happening so fast in the digital regime that logos, brands and icons were getting caught in the slipstream. Back in the 1990s it was all about Electronics, Electricity and Ecstasy: words that came to contain so much power that they could barely contain themselves. Enron actually managed to combine all three in the slogan for their TV commercials: ‘Ask Why’. This was always the tripped out, metaphysical, ultimate question that used to reduce computers to sparking piles of scrap in sci-fi fantasies about the return of human agency in the future. Now Wall-E has come along to clean up and sort through all that futuristic junk, straighten out the E once more and re-assure us once again that machines don’t kill the environment – people do. We salute every pixel of his being. Robot Power. Robot Pride. Graham Massey Curates Shunt Vaults October 1st, 2nd, 3rd and 4th. It is clear from his latest collaboration with artist Victoria Halford that writer Steve Beard does not believe in accidents. His characters tend to crawl towards their destiny, just as Walt Disney did – stranded on the afterlife plane, haunted by his demon brother – in Beard’s script for the London Fieldworks film 'Hibernator'. It would be a shame to dwell in too much depth upon the narrative for Halford and Beard’s ‘Czar 52 Crash’, the latest release from Tony White’s Piece of Paper Press. As with previous limited-edition offerings in this series, Halford and Beard use both sides of their A4 sheet to great effect: the result is 16-page graphic novella in which a flight-path map, an altitude indicator display screen and a cockpit voice recorder transcript tell a story that might have you watching the skies a little closer than usual. Not all those planes overhead are there for your protection. ‘More secret history,’ Beard cheerfully observes, and you know he’s right. The history we already know is the one we’re most ready to forget. Be nice to both of them. This blog is having some adjustments made behind the scenes so that it can eventually take the place of my woefully out of date kenhollings.com website. Something approaching normal service will be resumed as soon as we’ve finished sweeping the bunker out. Was in the front row at the Royal Albert Hall for a special event at this year’s Proms to commemorate the work of Karlheinz Stockhausen, who died at the end of last year. To hear Gruppen (1955-57) for three orchestras back to back with Kontakte (1959-60) for piano, percussion and electronics is to be reminded once again of how bold and challenging his musical vision was during this intense period. Each work seemed huge: undiminished by the passage of time or changes in custom. It brought back memories of meeting Stockhausen at his home in Kürten, West Germany, to talk with him at the end of the last millennium. Right at the start of the interview, as soon as my tape machine had been switched on, the pen in my hand started leaking. Stockhausen was wearing crisp white jeans, a white Indian cotton shirt and a fluorescent orange cardigan. We were sitting side by side in his home on what looked like a white patio sun lounger upholstered in pastel shades. The room was immaculately clean and tidy with bright white walls. I had black ink all over my fingers. At the end of the interview Stockhausen looked me straight in the eyes. ‘I like you,’ he said. Stockhausen had told me of his desire to be reborn towards the centre of the universe to continue with his music. Back in the hotel room, unable to sleep, I channel-surfed until I came across a programme showing satellite footage of the surface of the Earth accompanied by ambient techno music. Was it broadcast live? A caption on the screen revealed that we were passing over the Arizona desert. It was a dusty ethereal brown. I remembered how Stockhausen had responded when I suggested that we tended to pay homage to that which is not there, which is why space travel was being celebrated so much because it seemed more unattainable than ever. ‘No, it’s absolutely clear,’ he said with an enthusiasm that seemed to come from somewhere deep inside him, ‘I don’t know if you know the new books from the Hubble telescope, publications from NASA, but it’s absolutely clear that they will be on Mars in 2012…I know that they are going to go very quick now into the solar system.’ I loved that moment. It was my favourite part of the entire interview. 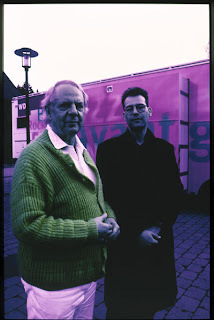 The photograph of Stockhausen and me standing together was taken 12.3.99 by Philip Lethen, using infrared film (see www.philiplethen.com/). The text above is adapted from my piece ‘Karlheinz Stockhausen, The Outer Universe And Me’ written for the Sydney Biennale 2002. For the complete transcript of my conversation with Stockhausen go to http://www.thewire.co.uk/articles/140/ My profile of Stockhausen appeared in issue 184 of The Wire for June 1999. 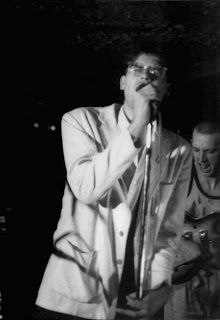 Just returned from a brief visit to Manchester, where I was recording a text for the soundtrack to a new Biting Tongues video, The Dragman, which should be ready in the autumn. Graham Massey had already produced a rhythm bed for me to work with, comprising a session with drummer Eddie Sherwood and sound files supplied by bassist Colin Seddon. The resulting track sounded amazing: this new ‘hyperlocal’ way of recording and assembling material from different sites and moments seems to suit the rather fractured approach to composing that Biting Tongues attempted to carry over from their live performances to their work in the studio. The Dragman started out as a text I wrote for some of the later Tongues shows and was originally arranged for three voices. I had sent a copy of it to Howard Walmsley, who thought its fragmented storyboard narrative might form the basis for an interesting short film. He broke the text down into short scenes and took the resulting shooting script with him to China last year, where he worked with calligraphy and English language students at an art college near Monkey Mountain, translating and recreating parts of the text. The results are eerily beautiful. There will be more on the making of The Dragman as production continues. It is hoped that the film will be finished in time for the four-day residency Graham Massey is curating at the Shunt Vaults in London this October. Taking place between 1.10 and 4.10, it will feature performances from Biting Tongues, Tool Shed, Massonix, Oort, plus surprise guests, DJs and MCs. Again, more on this as it comes up. 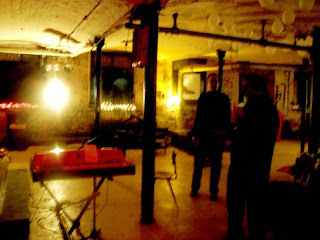 Photo credit: Ken Hollings and Howard Walmsley during Biting Tongues rehearsals at Islington Mill, Salford, taken by Graham Massey 22.2.07.